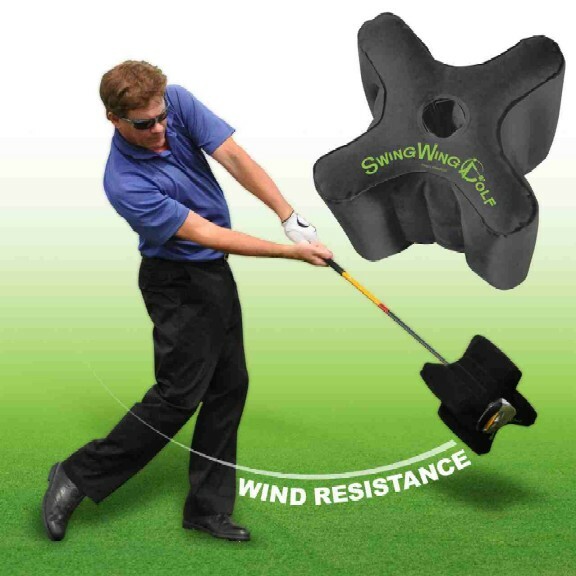 SwingWing Golf has a new twist on the old idea of using a weighted club to strengthen and perfect your swing called the SwingWing, an inflatable 4-vaned power swing trainer that uses wind resistance rather than weights. It is lightweight, easy to blow up and installation is as simple as sliding it over the grip end of the club. Made from flocked vinyl, SwingWing won’t scratch your club and is makes sense for use as a pre-round warm up when there’s not time for the range.To build power and strength use SwingWing 10 to 20 times gradually increasing swing speed. Gitre also says it’s great for working on swing tempo, to firm up the wrists during chipping and putting and when held between your forearms it keeps them in proper position during full swings. Deflated the SwingWing stores easily in a golf bag or may be attached to a towel hook. Retail price is $29.99 including a 60-day money back guarantee and it may be purchased at www.SwingWingGolf.com.